Ortega’s award-winning service is the Thermador appliance repair Santa Fe & Albuquerque residents have invested their confidence in for over forty years. Our expert technicians are factory approved to service a number of brands including BSH’s Bosch, Gaggenau, and Thermador appliances. With a commitment to excellence, Ortega’s Appliance will proudly deliver fast, friendly, and dependable service to your home. Thermador has been bringing innovative appliances to the American kitchen for over a century. Their line of iconic products featuring a timeless design can be found in homes around the world. From cooking and refrigeration to cleaning and ventilation machines, the Thermador brand is trusted both residentially and commercially. If ever your Thermador appliances need repairs or maintenance, make sure that the appliance repair company you choose is just as trustworthy. Ortega’s Appliance Service offers the exceptional Thermador appliance repair Albuquerque can depend on. Ortega’s Appliance Service is thankful for the relationships developed between our friendly staff and our kind customers. It’s our goal to not only fix a faulty device, but to exceed expectations and provide the absolute best experience for our customers from their initial call until they are completely satisfied. We strive to deliver fast and dependable service, and because of such a strong commitment to doing right by our customers, we’ve been humbly recognized with local and national awards. Instead of rearranging your schedule, you can effortlessly schedule a service appointment at a time that’s best for you on our website. There, you can provide us with a model and serial number which will allow us to start pre-diagnosing the appliance. When we arrive, we’ll be ready to assess the machine and determine what we believe would be your best course of action. In many cases, our fully stocked service van already has the replacement part you need. Once we get your machine back to working order, we’ll extend extra reassurance with a 90-day warranty in which we’ll come back free of charge if the machine breaks down once again. After we’ve fixed the problem, we’ll continue to keep your satisfaction our top priority as we further protect your machine with a one-year warranty on both parts and labor. Ortega’s friendly staff are waiting to take your call and get your appliance back to working order. 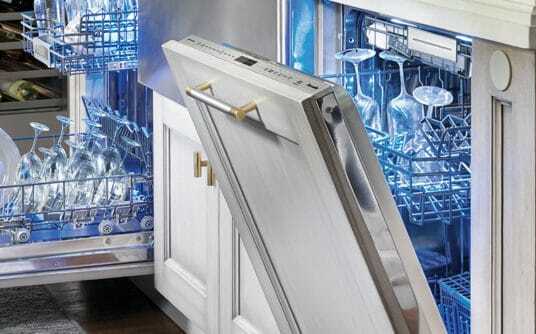 Trust the Thermador appliance repair Albuquerque & Santa Fe families depend on. Trust Ortega’s Appliance Service.